As we all know, getting students to understand the whole IDEA of a proof is difficult. Then throw in theorems, postulates, reasons, statements UGH...it's too much. 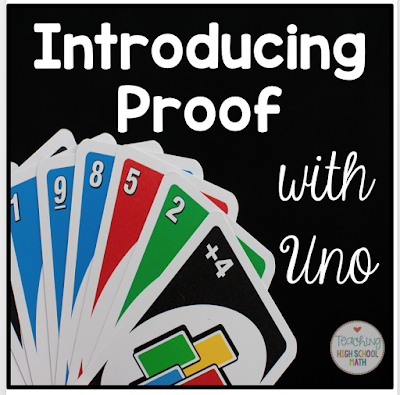 The reason I love using Uno to start teaching proof is that you begin the lesson with something students are familiar with - many have played Uno before. 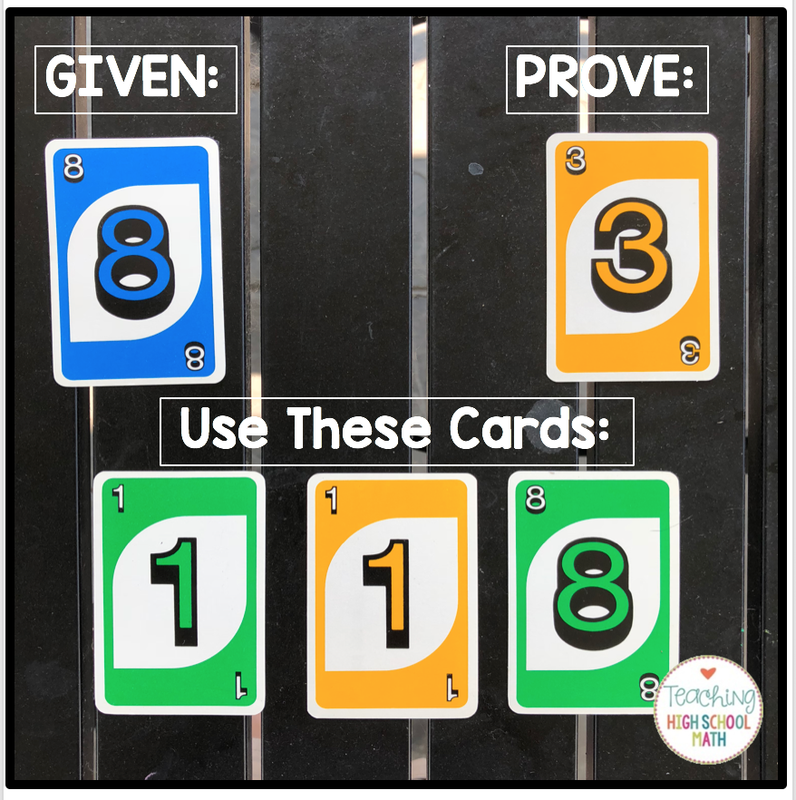 The general idea is to give students some number of Uno cards. There is a card for them to begin with [GIVEN] and a card for them to end with [what they are trying to PROVE]. Students are also given some number of additional cards. Then they are asked to find a way to get from the GIVEN card to the PROVE card by playing a hand of Uno. For example, start the students with this layout of cards. 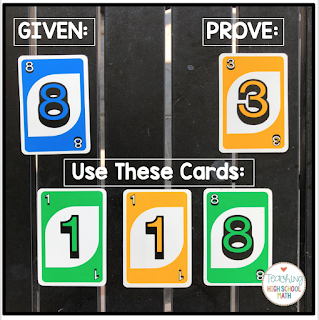 Students may realize that if they start with the blue 8, the game could proceed by playing the green 8, then the green 1, the yellow 1, and finally ending with the yellow 3. The cards must be played in this order...if they aren't, the rules of the game are not followed. 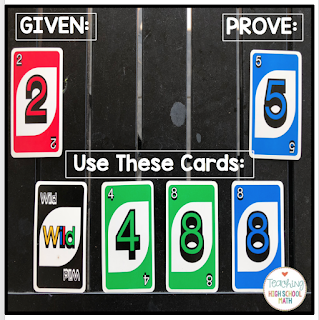 After a bit, you could introduce the Wild Card - it can be played just like in real Uno...you can use it to change to any color. It helps you move through the game, or in our case, the proof. 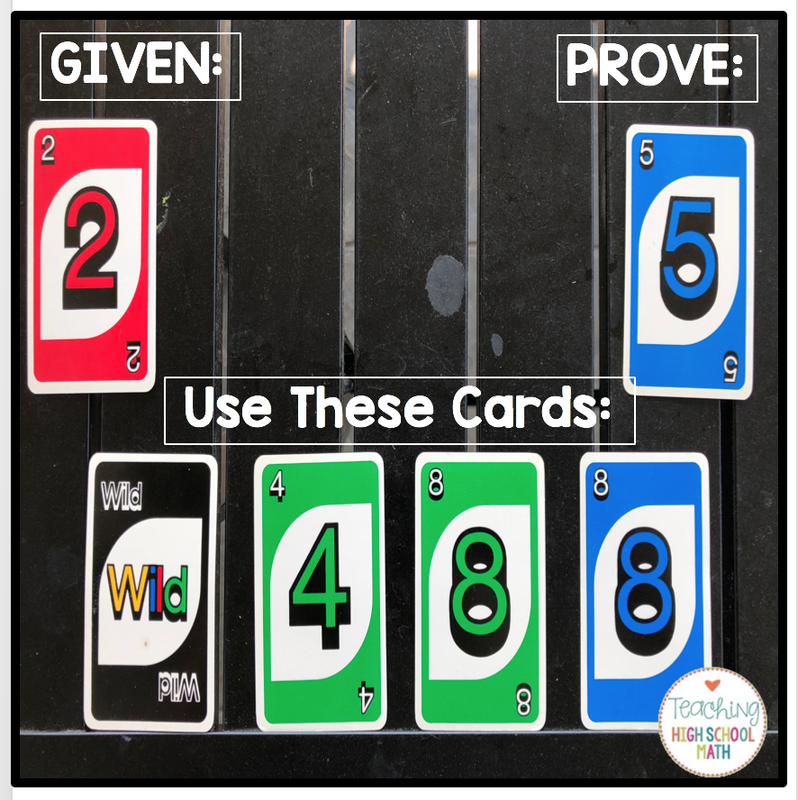 Students must realize that they can't complete the game without using the Wild Card to change to the green color. 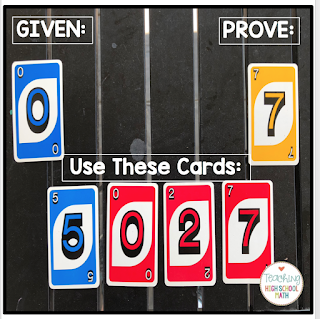 After the students understand the idea, you could provide students with extra cards that aren't needed for the proof, but could be included. It isn't WRONG to put them in the proof, but they make the game (or proof) longer than necessary. Or, you might be given an extra card that CAN'T be included in the game - it doesn't fit at all. In this case, the 5 isn't necessary at all. It's tempting to use it after the blue 0, but then you can't proceed without any of the other cards. 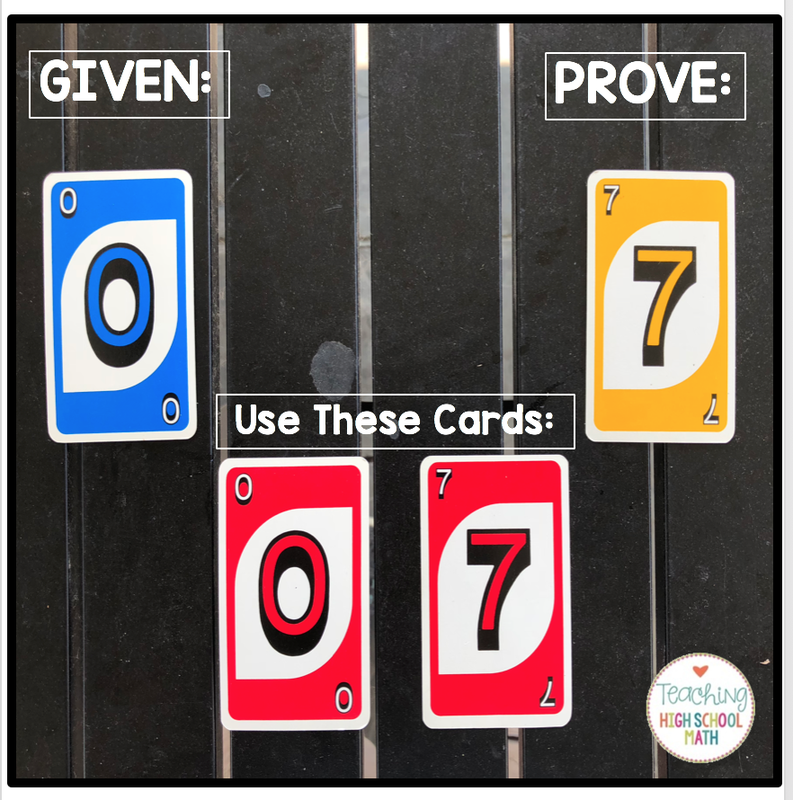 Notice that we could just use the red 0 and the red 7 to finish the proof. The red 2 isn't necessary, but could be included. The proof would just be longer. After students understand the idea of sequencing the cards, then you can introduce the two column proof format. I love this idea! My fiance and I are tutors and this is just a fantastic way to reach kids who need something hands on and familiar to be idge that gap. Just found your blog and love it! One word... GENIUS! Thanks for sharing! love this idea, going to try it this year! In Geometry, I always struggle with how to introduce proofs to them. I think this would be perfect. Thanks for sharing.